SAASSO is the parent body for public education in South Australia. A volunteer organisation, SAASSO has been supporting the role and right of parents in the education of their children since 1923. 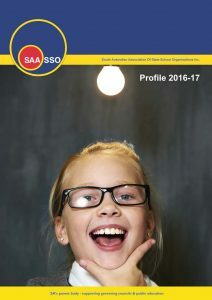 SAASSO is the Governing Council Association for South Australia’s public schools. SAASSO supports and advocates for parent-led Governing Councils in their role as the governing body in public schools.